Cold brew is quickly becoming the most popular caffeinated beverage, especially on warm days! Why not provide delicious South Fork cold brew coffee that your staff can enjoy, without actually having to leave the office? Our customers say it tastes better than what they are paying for at the drive-thru. And we now offer our cold brew coffee delivery straight to your office! Cold brewing coffee is a brewing process that doesn’t require heat. Instead, you soak coarsely ground beans in cool water for 12 to 24 hours. Then, add ice and the result is a smooth, refreshing coffee experience & the perfect pick-me-up for the afternoon hours. Put six bags of our South Fork Filter Packs (we recommend our Guatemalan Blend) in the 2.5-gallon drink dispenser we provide for you (FREE!). Add 2 gallons South Fork filtered water! Let coffee steep for 12 to 24 hours for best flavor. Remove filter packs and enjoy cold brew over ice! Store the cold brew coffee on the counter for up to 7 days, or in the refrigerator for up to 15 days. No bitter, acidic coffee taste. No daily brewing, pour straight from drink dispenser over ice. Save time and money on trips to the coffee shop. Keep your office refrigerator stocked at all times. Our delivery program includes consistent delivery to your office and is flexible to expand or contract depending on consumption levels. 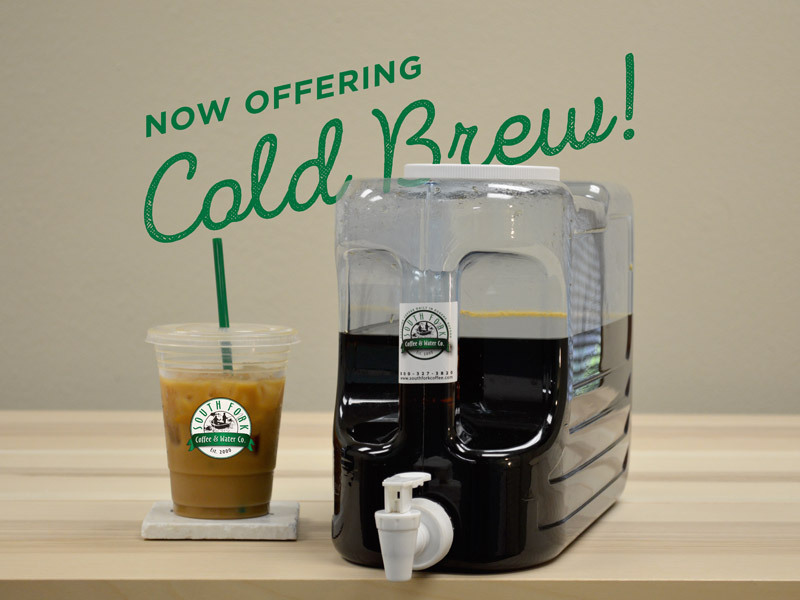 If you’d like to order a cold brew setup for your office, click here to contact us. We can hook you up with the brewing supplies including coffee filter packs, a FREE 2.5-gallon beverage dispenser, 12 or 16 oz. cold cups, and single-use cream!